Aegisbane is an iron warhammer and the ancestral weapon of Clan Shatter-Shield. It had recently been stolen by the bandit Alain Dufont, who managed to get close to the clan through the seduction of a friend of the family, Muiri. This weapon's enchantment causes five points of frost damage upon hit, along with slowing them down by fifty percent for three seconds. Tempering Aegisbane requires one iron ingot and the Arcane Blacksmith perk. 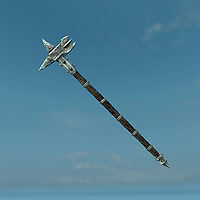 While in Windhelm with the warhammer equipped, guards may comment on the weapon's recent history by saying: "Ah, Aegisbane. Sigil of Clan Shatter-Shield. But didn't that get stolen awhile back? Hmph. Must be rememberin' wrong." or "That hammer... Why that's Aegisbane, heirloom of Clan Shatter-Shield! Last I heard, it was stolen by a couple of swindlers. Alain and... Muiri. Yeah." Aegis was a shield in Greek mythology, so the name of this weapon translates to "shield bane" (a reference to Clan Shatter-Shield).